The Short Version: Over 30 million users strong, FirstMet is among the largest dating apps on Facebook, with about 40% of their membership located internationally. Hoping to better serve this diversity of users, FirstMet recently updated the platform: expanding their targeted audience to include people looking for meaningful connections of all kinds. Whether you seek friendship, romance, or lifelong love, this website and app has a place for you. FirstMet connects users in a low-pressure environment via their Facebook profiles, matching people effortlessly and authentically through common interests and friend networks. In April 2011, Willis took a chance on love and created a dating profile on FirstMet. He wasn’t very hopeful about his prospects — he’d already had 25 accounts on other dating websites. Little did he know his luck was about to change. Within three weeks of joining FirstMet, he met the love of his life. The moment he set eyes on Esther, he never wanted to be anywhere but by her side. She felt the same way, and after a few weeks of dating, she moved her life from Tahiti to the U.S. to be closer to him. On December 12, 2012, the couple got married in a Tahitian-style wedding. After the ceremony, the newlyweds took to the road, traveling across the United States in a whirlwind lifestyle and loving every minute of it. Willis and Esther’s story is just one of many instances of a deep connection made on FirstMet. On this multi-platform dating site, singles meet new people in a casual online environment. With a new look and helpful features, this site facilitates happily-ever-afters for singles looking for friendship, romance, or true love. The flagship brand of Snap Interactive Inc., FirstMet evolved from the former dating site Are You Interested (AYI). With a distinguished career in the online dating industry, Alex Harrington joined SNAP in 2014. Founded in 2007, AYI’s network reached over 30 million singles across the globe. However, the team thought they could do better. Now, FirstMet offers users an improved online experience with a better look and enhanced mobile capability. Keeping the intuitive design and popular features of AYI, this new space opens singles up to all kinds of possibilities from casual friendship to serious commitment. A quick sign-up process and ready-made icebreaker can get you into a conversation in no time. SNAP Interactive keeps close tabs on how their customers are doing. During in-depth interviews with AYI users, the team found that a large number of people used the site just for casual chatting, meeting new people, and seeing where things go without any long-term intentions. To build a more useful, targeted brand for customers, SNAP Interactive adapted its message and look to reflect its role as a dating platform and general social network. Today, FirstMet is a great place to meet new people who share your interests. FirstMet profiles offer a range of quick facts about a person’s background, hobbies, and interests. The Icebreakers are quick questions that you can choose to send to another user. Questions like “Do you enjoy cuddling?” or “Rolling Stones or Beatles?” give you both something to talk about. In addition to tried-and-true features like Icebreakers, there’s plenty on the horizon that’s sure to excite and invite singles to sign up. A new bonus for users is that FirstMet allows free messaging to matches, letting singles get to know each other better at no cost. If someone you like likes you back, you don’t have to upgrade your membership to send a message and start a conversation. While updating the look of the site and app, the SNAP team also streamlined their internal infrastructure so that updates and improvements can be made more frequently. Over the years, SNAP Interactive has garnered a loyal user base of over 30 million singles. Roughly 60% of their users are in the U.S., and the rest are international. A key demographic in FirstMet’s membership is the 35 and older users. Adults gravitated toward the site naturally and were welcomed by an open-minded atmosphere. The team saw that this demographic wasn’t getting the attention it deserves from other sites, so it adapted to better fit a more mature crowd. Whether you’re looking for a date, a friend, or a community, FirstMet has many diverse people available for easy chatting online. You could meet a new friend or a new spouse. You never know. This newly minted space lessens the intimidation factor of putting yourself out there. FirstMet encourages singles to take more of a see-where-it-goes outlook. It could be love, romance, or friendship — there isn’t one path to a meaningful connection. “By broadening the scope of what users’ intentions could be on the site, it lowers the pressure they may feel when reaching out to someone,” Alex said. People lead busy lives and often don’t have a lot of time to devote to dating. Mobile dating gives singles that freedom and flexibility to flirt anywhere and anytime they choose. For FirstMet, mobile has become a greater priority. FirstMet perfected its mobile design to better serve singles on-the-go. Mobile innovation and improvement is the focal point for the company, and the newly released FirstMet iPhone and Android apps reflect that. 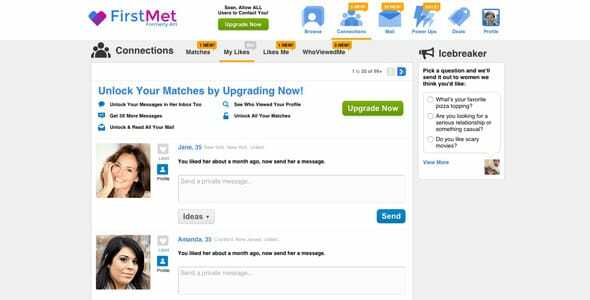 A clean, crisp, and user-friendly design ushers singles into an altogether better dating experience. 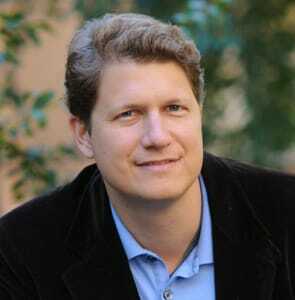 “Our developers have worked tirelessly to rebuild the iPhone and Android apps from the ground up,” he said. As online dating shifts toward a mobile audience, FirstMet welcomes a new kind of single into their ranks. With quick browsing and fast matching, the app creates a casual and open-ended place to flirt. Based in New York City, SNAP Interactive fosters a joyful startup atmosphere. At these offices, the walls are white boards, and every person on this tight-knit team is encouraged to collaborate, experiment, and innovate. Free weekly massages and company-sponsored happy hours are just the tip of the iceberg of what this company culture has to offer its employees. SNAP’s team of roughly 25 people plays hard and works harder. 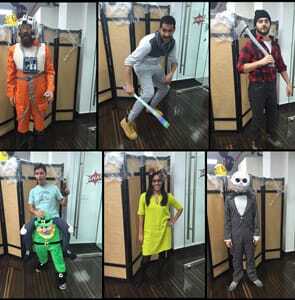 Team members enthusiastically dressed up for SNAP Interactive’s Halloween party. The many company perks include season tickets to the Knicks, a gym membership discount, and a ping pong table in the office. “We believe in team building and bonding as a group,” Alex said. The company certainly does bond in group activities like paint nights, bowling, and renaissance fairs. SNAP frequently hosts fun and free events that include Smash Brothers tournaments, summer barbeques, and friendly games of dodgeball. The [email protected] blog is full of side-splitting stories and mouth-watering pictures. With streamers and snacks galore, the team decks out the office for holidays, even combining Cinco de Mayo with May the Fourth Be With You — using pretty much any excuse to dress up and have goodies at work. Whether it’s a chocolate fountain for Valentine’s Day or a full dinner spread for Friendsgiving, this team does holidays right. These bonding good times help with team unity as they work toward making the best product possible for singles. This is a dating platform that lets singles meet with no pressure and no judgment. Not all meetups have to end like Willis and Esther’s love story. FirstMet’s social network facilitates many happy marriages, but the team is just as happy to hear stories about pen pals and friendships formed as a result of the site. An open-ended space, FirstMet encourages anyone taking a broad and casual approach to romance. It doesn’t have to be about finding “the one.” You can simply send an Icebreaker to someone who interests you and take it from there.